MOSCOW -- Vladimir Putin was sworn in as Russia’s president for a fourth term on Monday, extending his almost two-decade rule by another six years at a time of high tension with his Western rivals. The 65-year-old, in power since 1999, is on course to become the longest-serving Russian leader since Joseph Stalin after his victory in March elections. Putin won nearly 77 percent of the vote in polls in which his most vocal opponent, Alexei Navalny, was banned from running. He has promised to use his fourth term to revitalize the economy. But he also faces a host of thorny international disputes. “I consider it my duty and my life’s aim to do everything possible for Russia, for its present and for its future,” Putin said at Monday’s swearing-in ceremony, with his hand on the Russian constitution. US President Donald Trump congratulated the Kremlin strongman, with White House press secretary Sarah Sanders telling reporters in Washington that Trump “looks forward to a time when we can hopefully have a good relationship with Russia. “However, the United States believes that everyone has a right to be heard and assemble peacefully,” she said. 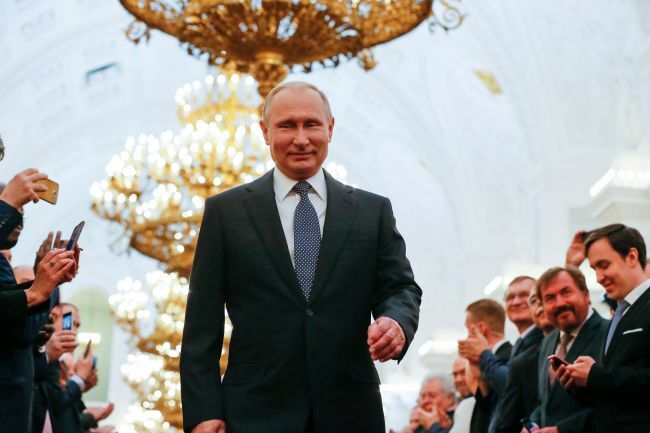 Several thousand guests lined the red carpet in Moscow and filmed Putin on their smartphones as he arrived for the ceremony in the ornate Andreyev Hall, part of the Kremlin palace complex. Among them were US action star Steven Seagal, who has taken Russian citizenship, as well as former German chancellor Gerhard Schroeder and Naina Yeltsina, the widow of Putin’s late predecessor Boris Yeltsin. Putin was driven to the inauguration in a black Russian-made limousine -- a change from previous ceremonies when he used a German Mercedes. Shortly after the ceremony, Putin asked parliament to back a new mandate for outgoing Prime Minister Dmitry Medvedev, his longtime ally. Navalny on Monday reposted a 2017 video into the prime minister’s alleged wealth that led to nationwide protests last year. The opposition figure, who was barred from challenging Putin in the March election, has been released pending a court hearing. The unrest revived memories of 2012, when authorities cracked down on rallies against Putin’s return to the Kremlin after a stint as prime minister. Russia’s ties with the West have been strained by Putin’s annexation of Crimea from Ukraine and his military campaign in Syria in support of longtime Russian ally President Bashar al-Assad. In recent months relations have soured further over accusations of the poisoning of an ex-spy in Britain and of election meddling in the United States. “For Putin any concession is a sign of weakness, so there shouldn’t be any expectation of a change in foreign policy,” said Konstantin Kalachev, the head of the Political Expert Group think tank in Moscow. The constitution bars Putin from running again when his fourth term ends in 2024. But he has remained silent on the issue of his succession. Putin has promised to use his fourth term to improve Russians’ standard of living. “People will live better,” he said. Hours after the inauguration ceremony, Putin issued a decree setting targets for his next six years in power. These included halving Russia’s poverty rate, increasing pensions and boosting the average life expectancy to 78 by 2024. A new poll by Russia’s independent Levada Center found that while the majority of Russians support Putin’s foreign policy, the main complaints are over the economy. The survey showed 45 percent of Russians believe Putin has been unable to achieve a “fair distribution” of state revenues to benefit ordinary people. Russian businesses are expecting wide-ranging reforms to the government’s heavily bureaucratized system. According to statistics published in the RBC newspaper on Monday, the number of bureaucrats during Putin’s third term rose by 50 percent, from 1.57 million to 2.17 million.